The idea of not giving a f*ck is a simple way of reorienting our expectations for life and choosing what is important according to Mark Manson in The Subtle Art of Not Giving a F*uck: A Counterintuitive Approach to Living a Good Life. We are all wrong, all the time, some are just a little less wrong than others. Things go wrong, for everyone, so happiness is learning how to appreciate the struggles in life. You are not special, stop trying to prove yourself. Life is about solving problems, therefore pick good problems to solve. Always be skeptical of yourself and have a fluid sense of your identity. Conflict is necessary and inevitable. Learn to deal with it. Manson suggests that most people who have “first world” problems are often victims of their own mentality and these problems stem from the fact that they have nothing more important to worry about. In addition, some people choose to believe that there is nothing they can do to change their situation. But there is always something that you can do. Changing the way you perceive problems and overcoming this victim mentality requires an individual to take extreme ownership. This can then reorient the way we choose to approach situations and help to overcome feelings of anger, helplessness and despair. This is a self help book that challenges you to stop sweating the small stuff, find your purpose and embrace your faults in order to live a more content and happy life. Pedagogy and space are inextricably linked. They are not mutually exclusive. Progressive pedagogies can exist within even the most traditional of spaces, as can traditional pedagogies in the most modern and contemporary space. Space shouldn’t be used as an excuse for a particular approach to teaching and learning but often schools are restricted by their physical space and lack the necessary budgets or locations to physically change the infrastructure of their buildings. So without access to new buildings and significant budgets for new furniture what can be done to transform existing spaces? Here are four simple things that can disrupt the traditional way of thinking about how a classroom environment operates. Arrange the room so that there is no “front” of the room. This is actually easier than it sounds with some judicious placing and rearranging of existing furniture. What this does is change the dominant paradigm of teacher standing at the front, students facing the teacher, and teacher delivering the required information to students. Our Vision for Learning talks about what we believe when it comes to pedagogy – “We believe that the preferred kind of pedagogy is learner-centred and learner-driven, project-based and experiential by nature, interspersed with purposeful periods of direct instruction.” Purposeful is the key word here as direct instruction is still important but it shouldn’t be the dominant style of pedagogy. This supports the idea of removing the front of the room. Instead of purchasing an expensive interactive whiteboard or a 90″ LCD screen, purchase 4 smaller LCD screens and position them either on stands or mounted on swivels at various locations around the room. Also provide a wireless presentation gateway to each room. We use the WiPG-2000 as a wireless presentation gateway which allows a single device to project to multiple screens or for a screen to have 4 devices connected to it simultaneously as a 4-way split screen. This allows students and teachers to connect, share and collaborate in new and various ways. This one is simple. Have less chairs than students. This can cause a serious rethink about how a class operates. This doesn’t necessarily require the purchase of new furniture, just get creative. We have used old student lockers as standing work spaces, or have reused old whiteboards and re-purposed them as collaborative work tables. The theme of the recent PDN Principals conference was Influence and it aimed to provide a rich and rewarding exchange of ideas and possibilities; arousing intellectual curiosity with world class researchers and speakers that included Emeritus Professor Christopher Day, Dr John Edwards, and Andrew Griffiths. 1. Create a shared vision. In creating a vision I’m not talking about a generic vision statement here, not something that looks exactly like every other school in the world that says something about innovation, differentiation, personalized learning and independent learners, I’m talking about a collaboratively constructed, shared vision for the future of learning. 2. Shift from passive to active. Shift the notion that professional learning is something that is done to you as opposed to something that you do for yourself. Implement the concept of a learning project. People need to know that innovation isn’t about devaluaing anyone’s work. Innovation isn’t necessarily a deficit statement. Being innovative however requires us to step outside of the normal and suspend our biases. Suspending our biases allows us to develop a capacity to disassociate from the way things have always been done. By developing this capacity we give ourselves permission to innovate. 4. Make your default “yes”. As a leader make your default answer “yes.” Say “yes” to everything. Encourage all ideas. Even the ridiculous ones. If you really want to create an environment that allows for innovation, big innovation is right on the edge of ridiculous ideas. That means you support every single idea that comes to you from your teaching staff – ask them to try their ideas, to evaluate it, to refine it and then to share it widely. 5. Tell people they’re awesome. Teachers have one of the most important jobs in the world and many if not all of them work so hard, day in day out, often working late into the night every night, trying to create the most memorable learning experiences that they can for kids. To positively influence a learning culture you need to constantly thank people for their work. Leave handwritten notes on their desks. Share their work widely. Celebrate successes loudly no matter how small they may be. I love sharing at conferences like this one. Of course, what works in one context may not work in another, but I believe these five things are the building blocks for creating a thriving teaching and learning culture in any school. Get in touch if you would like to find out more! The most interesting innovations in machine translation will come with the human interface. In ten years, a small earpiece will whisper what is being said to you in your native language near simultaneously to the foreign language being spoken. The lag time will be the speed of sound. Undetectable. The voice in your ear will not be a computer voice like Siri. Because of advances in bioacoustic engineering measuring the frequency, wavelength, sound intensity, and other properties of the voice, the software in the cloud connected to the earpeice in your ear will recreate the voice of the speaker, but speaking your native language. We already have Skype Translator, an online real time translation service for Skype. Currently it supports seven languages for voice calls and more than fifty languages for instant messaging. It is developing in sophistication almost daily as it uses machine learning algorithms which increase its efficacy the more it gets used. Pilot is one of the first attempts at developing a smart earpeice language translator that sees the convergence of wearable technology and machine translation. It won’t be the last. The small team developing this product has just been successful in its crowd funding campaign raising 3170% of its initial funding goal. What does all this mean for the future of language learning? Not much at the moment. It will take many years before the technology reaches maturity. In the immediate short term we will see learners and institutions take advantage of the increasing capabilities of machine language translation in current learning contexts. Whether a non native speaker is sitting in a physical classroom or accessing their education virtually, the assistive capabilities of real time language translation will enable a deeper engagement and provide new levels of accessibility for the keen but less proficient non native speaking student. With international education in Australia being a $20 billion industry, any institutional strategy for developing students’ English language proficiency and capability should consider the implications of the emerging technology of machine translation. Crumpler has given away the pattern for one of their original messenger-style bags via an initiative called the Crumpler Kitchen. 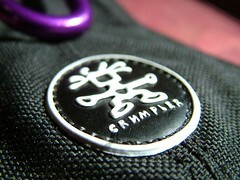 As a big fan of Crumpler, this seemed like a great opportunity for a project for our Year 5’s. Examining the pattern and scaling to size. Sourcing approximately two meters of shoulder strap webbing, some Velcro, a clip or a buckle and something to adjust the strap length. Learning to use a sewing machine. Using 2D Design to design a Crumpler-esque badge for their bag. Similar to this one. Hand-stitching the badge to their bag. Students will show their creations to the Crumpler Team upon completion. This is a real project that has process, product and audience and effectively uses technology to create something of value. Immersion experiences like our Fulfilling Lives program, encourage self-reflection on attitudes towards cultural difference, provide opportunities to build relationships, to serve and work with community members and invite the application of knowledge and skills as outlined in the Contributing dimension of our Vision for Learning. This is some of the video that was captured of our recent experience in Borneo.